Monte Fresco MBE is one of the SJA’s most renowned members, following a 50-year career as a top sports photographer, including three decades at the Daily Mirror. Here, Monte answers the SJA Questionnaire. Joined Topical Press in the 1950s as a runner boy, then went on to become a dark room photographic printer in Red Lion Court, Fleet Street, while covering bigger sporting events evenings and weekends (obtaining entrance to venues was so much easier in those days). On my 18th birthday Topical made me a “Junior Photographer”, one of my great highlights. When Topical Press closed I moved on to International News Photos, part of the American Hearst Corporation covering all assignments. When INP merged with Planet News I was offered a photographer’s position. Ted Taylor, boss of INP, had recommended me to the Daily Mirror, where they made me a salaried freelance photographer for almost a year. Taken on the staff of the Mirror in 1958, going on to become Chief Sports Photographer for 30 years [where his work included this iconic image of Vinnie Jones getting to grips with the game in midfield, and Paul Gascoigne]. Moved on in 1988 (during the Maxwell era) joining Bob Thomas Sports Photography as Director/Photographer, still covering major sporting events worldwide. Later merged with Popperfoto.com. Invested with an MBE in October 1995 for “Services To Sports Photography”. Retired in 2004. What made you want to be a photographer? And to work in sport? As a young man I enjoyed sport, played football and boxed. Would love to have been a success at either but sadly it was not to be, having discovered I only possessed vision in my left eye. The next best thing to taking part was taking pictures. This enabled me to attend major worldwide sporting events with the benefit of being the closest to the football matches other than the players, ref and linesmen, and boxing enjoyed close ups of the action from my ringside position. At the age of 15 covering a match at Cold Blow Lane, the home of Millwall, a terrifying experience for a youngster that stays with me to this day. 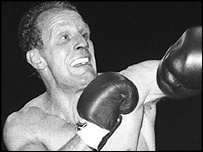 I have two most memorable – the first of course picturing England winning the World Cup in 1966, the second, achieving an ambition to cover a world heavyweight title fight in America. The year – 1971. The fight – two unbeaten heavyweight champions of the world, Muhammed Ali and Joe Frazier, in Madison Square Garden, New York won by Frazier on points. Two truly memorable assignments. If you did not work on sport, what do you think you might be doing? Any physical job in the great outdoors as I love fresh air. What sports do you play – and to what level? Golf – poorly!! Does any of your family have any involvement with sport or journalism (or both)? One son is an editor for Danish Television. What sports event would you most like to attend as a spectator? England winning the next World Cup. Recognition of the part us photographers play in recording history and events. More and more “Jobsworths” – the bane of every photographer’s life. Pat Collins – As a “Smudger” he is without a doubt my favourite “Blunt”.